With five languages, four national park, three borders, beaches and Alpine mountains, exceptional walking, gorgeous towns and fabulous food, the region of Friuli Venezia Giulia (FVG) has all the ingredients for a very special two week visit! With its mountains, plains and seashores all less than an hour's drive apart, Italian writer Ippolito Nievo fondly described Friuli as a "little compendium of the universe". This Hidden Italy special sets about exploring that universe. The tour starts with two days in Udine, an elegant provincial capital. We then drive north-east into the mountains to a beautifully preserved village above a lake in a quiet valley in the heart of the Carnian Alps, our base for the next four days. From here we go east across the plains to ‘Venetian Slovenia’, a wedge of beautiful forested hills that forms the frontier between Italy and Slovenia. Our base is an elegant old estate in the heart of the Collio wine producing area. Our last two nights are in the grand port city of Trieste, for four centuries the Mediterranean port for the Austro-Hungarian Empire - a fitting place to end our visit. We'll drop you off in Venice on the last day. Food is an important part of any visit to Italy but this is particularly true of FVG which has some of Italy’s finest produce, including Collio wines, San Daniele ham and Montasio cheese, while the farmers’ markets of Gorizia and Pordenone are legendary. The Via dei Sapori is an association twenty of the region’s best restaurants and we will follow their trail (there is one in each of the places we visit) using them as a key to unlock the secrets of FVG cooking. With its pristine forests, national parks and fascinating history, Friuli offers some wonderful walks, including exploring the valleys and mountains of the Carnian Alps; following the historic trails through the hills that hug the Slovenian border; walking through the vineyards of the Collio region. The walks range from 8 to 17 kms and follow well-marked trails, mostly unsealed country roads. In some cases it is possible to shorten the walk or to opt out and join the walkers for lunch. Gradings for the individual walks are on the itinerary - click the link for each day to see the details. The tour starts with two nights in a classic four-star hotel in the centre of Udine and finishes in one of the grand hotels of Italy: set in an elegant palazzo dating from 1727 overlooking the Piazza Unita d'Italia, the heart of Trieste. In between, we stay in a beautiful family-run mountain lodge for four nights and another four nights in an elegant old Austro-Hungarian estate in a vineyard on the edge of the captial of the Collio wine district. With its long coast line, fertile plains, unspoilt mountains and ancient traditions, the food of Friuli is as diverse as the region itself. Friuli also produces some of Italy's finest ingredients. 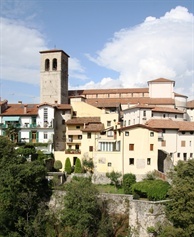 We'll use the 'Via dei Sapori', a group of the twenty finest restaurants in Friuli, to unlock the secrets, not only eating their wonderful meals but also visiting their suppliers: farmers markets, cheesemakers, prosciutto producers, vegetable growers, vignerons.... We will also enjoy a cooking lesson along the way. I first went to Italy as a backpacker in 1980 and fell in love with the country. I returned in 1983, living and working in Milan until 1988. Afterwards I worked at the Institute of Languages, University of New South Wales (Sydney) taking guided tours to Italy annually. I spent two years with my family in Prato (Florence) in 2003 and 2004, working at the Monash University (Melbourne) Centre. Since then I have dedicated myself full-time to Hidden Italy. I love photography and writing and have had articles and photographs on Italy published in most major Australian newspapers and travel magazines. I speak fluent Italian, alas with a pronounced Australian accent. "Great Walks" magazine recently said I had the best job in the world.. there are other much more worthy jobs around but I am lucky my passion has become my profession - click here to read their interview.